Hackney-born actor, DJ and now filmmaker Idris Elba makes his directorial debut with Yardie, a Caribbean twist on the well-worn conventions of the British gangster movie, based on the book by Victor Headley. 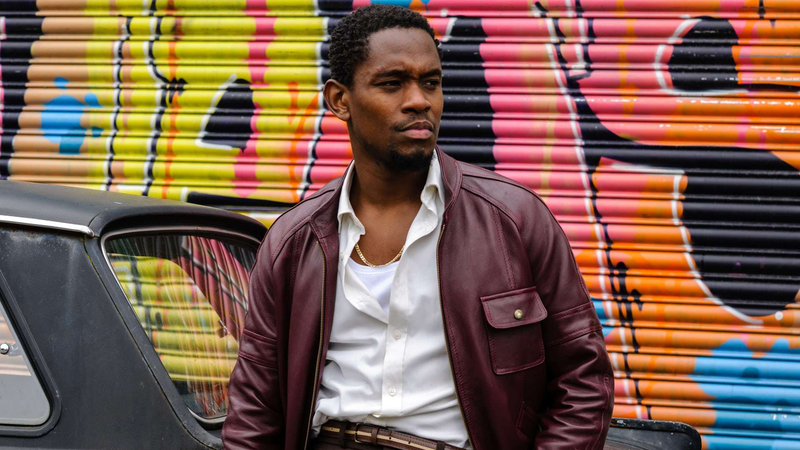 The film follows a Jamaican drug courier called D (Aml Ameen) who leaves the gang violence of Kingston, Jamaica only to find himself in the middle of an even bigger turf war in London. We first meet D in the 1970s, living in Jamaica with his big brother Jerry Dread (Everaldo Creary). In an attempt to call a ceasefire between the Tappa and Spicer gangs Jerry decides to organise an impromptu party to bring the rivals together. The night is a success and the whole neighbourhood is jumping but just as he manages to get the two mob bosses on the stage to shake hands, a gunshot shatters the atmosphere and Jerry is dead. A decade later, D still carries the pain of his brother’s death. It manifests itself as a “duppy”, a malevolent spirit which follows him everywhere, even all the way to East London, where he’s been sent to deliver a parcel of cocaine. However on arriving in Margaret Thatcher’s Britain; a time of discriminatory laws, and bubbling social tension, D quickly discovers that the streets of Hackney aren’t any safer than those at home. Aside from some stylistic brio, there’s no escaping the fact that Elba’s inexperience behind the camera is apparent in his over reliance on voiceover and a narrative that rarely veers away from the well trodden path forged by films like Goodfellas and City of God. Yet despite this abundance of generic contrivances, Yardie still feels fresh and invigorating, thanks to its refusal to Anglicise the patois vernacular and its use of dance hall music. Indeed, without these elements Yardie would be just another problematic depiction of the Black-British experience as one dominated by drugs and gang violence. Thousands of Jamaicans emigrated to Britain after the Second World War with the colonial promise of employment. Admittedly their line of work wasn’t as legally precarious as D’s, but like him many of them settled in Hackney where Caribbean customs and musical traditions were transplanted wholesale. It’s Elba’s understanding of the role sound-system played in forging the British-Jamaican identity which makes Yardie so compelling. A hand-picked soundtrack of vintage soul, reggae and dance hall merges with the sorrowful tones of Tindersticks’ Dickon Hinchliffe’s score to amp up the tension, adding colour and texture to a genre normally shrouded in darkness. D’s hustling in London soon lands him in hot water with a rival gang, so taking a page from his brother’s book he turns to music to help put an end to the violence. Climaxing with a sound-system battle, this flawed, yet enjoyable genre flick might make for an uninspiring crime drama, but as an opportunity to explore how central sound system culture was to West Indian communities throughout the UK, it’s unbeatable.